The mindset of the Dubai government and resources available to them start to manifest themselves as soon as you get off the plane and enter the Dubai International Terminal. It sparkles like a diamond, from the floor to the glass walls to the ceiling. The grand immigration hall is precisely that, grand. Three story ceilings, meticulously cleaned surfaces, immigration officers in their spotless white flowing robes. Interesting tidbit – Retina scanners are mounted behind the immigration officers, but woe be to those with small eyes, as the scanners will keep trying till an accurate scan is obtained, however long that may take. On US passports, a 30 day visa is granted upon arrival. Every public service is targeted to make the traveler comfortable. The taxi drivers are polite, with clean nice taxis. The Dubai government has made the desert green, which could be impressive, except that this is the same outfit that created the humongous Palm Island, as well as the ‘world’ islands by dredging up the ocean. The Palm Island is – no mystery here – in the shape of a palm tree, with its trunk connected to the rest of Dubai. The trunk is wide enough for two multi-lane highways, adorned by houses and mansions on the outside edges, close to the ocean. Residences also dot the palm fronds. The World Islands are replicas of all the continents. The things you can do when money is truly no object! You can fulfill your fantasy of owning North America or Africa here, if they are still available. What can you do in Dubai? Short answer. Anything you want, as long as you have the money. Dubai is part of the UAE, but it is a thriving center of commerce and finance, where foreigners are 70 percent of the population. 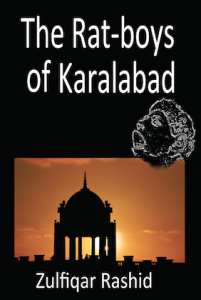 You can find Americans, Europeans, Chinese, Japanese – people from all parts of the world, but the largest portion hails from India and Pakistan. 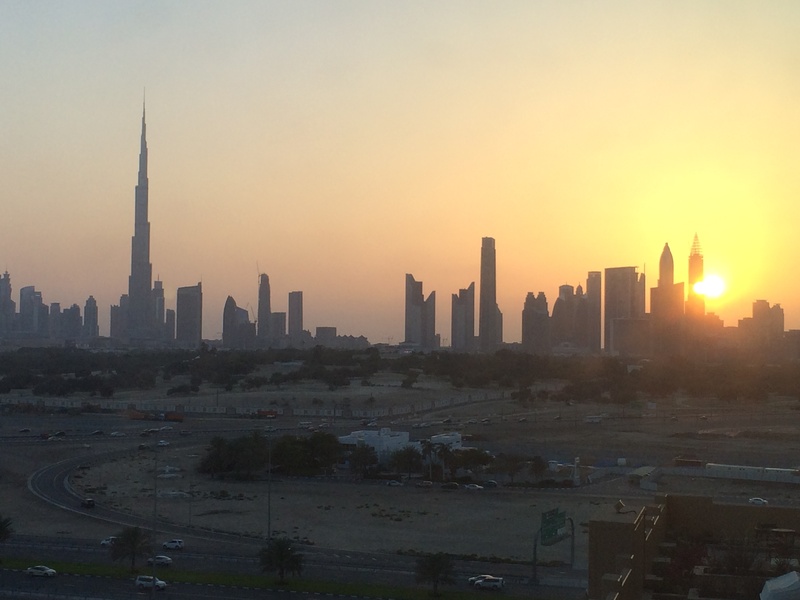 They are human fodder in the engine of growth and expansion that is Dubai. You like to shop? Welcome to paradise! Whether it is the relatively subdued Wafi Mall, the long established Mall of the Emirates, or the over-the-top, opulent, extravagant Dubai Mall, you will be able to find anything and everything, from pretty much any famous store from around the globe. 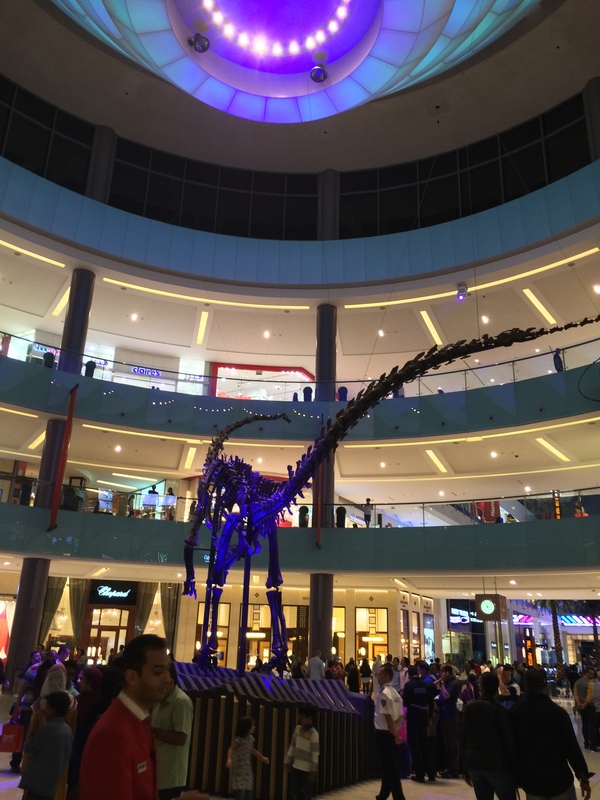 If you have just enough time to visit one of them, the clear choice is the Dubai Mall, but it is very likely you will simply not have enough time to visit all of it. At the entrance you are greeted by a life size T-Rex skeleton. You can go through store after store, till your legs are ready to give out, but the Mall will not end. If your children are with you, wait till you tell them that most of the third floor is dedicated to children’s clothes – designer brands that you may not be even aware carried infant and toddler clothing. You say you don’t want to shop? 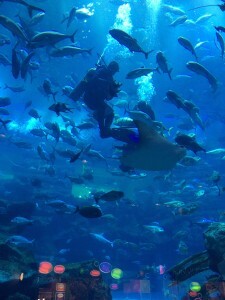 Well, the 11 million gallon, 11 meters (33 feet) deep Dubai Aquarium resides inside the mall. The sharks, hammerheads, manta rays, and dizzying arrayof fishes – over 85 species, will keep you occupied not only from the outside, but you can also pay to slip into a wetsuit, and slide into the aquarium to feed the fish or be surrounded by sharks inside a steel cage. If that is too much, you can take a very short glass-bottom boat tour. 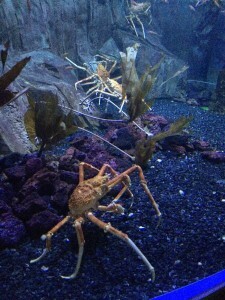 As if the aquarium was not enough, you can also spend a couple of hours walking through the sea-zoo, the reptile exhibit, and the insect exhibit. Exhausted yet? Hungry? Try and select a place to eat from the multitude of restaurants in the very upscale food court, or the other enticing eateries peppered throughout the mall. If you are into it, you will be able to tell your friends about your experience of having lunch or dinner at the buzzing Armani cafe or Versace Bistro. Truly, branding is everything. 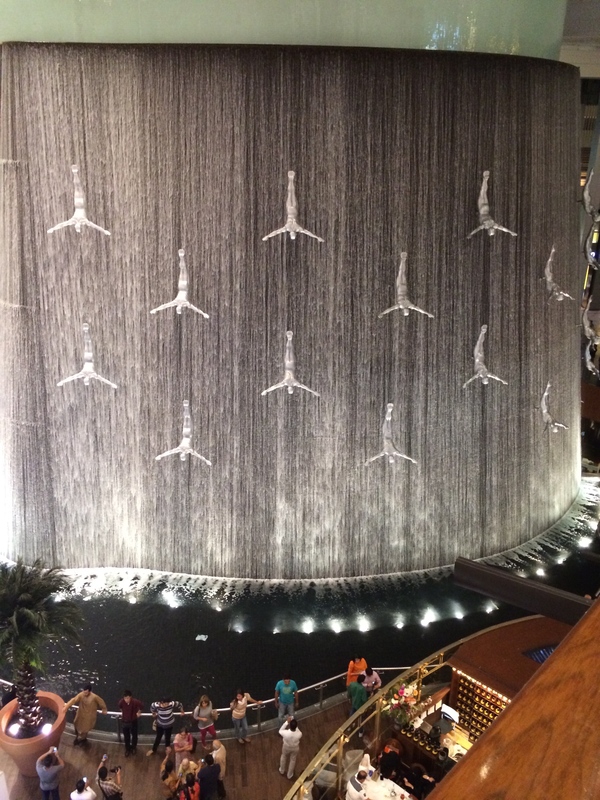 Admire the three story glass, cloth and crystal chandelier, the four story waterfall wall adorned with tens of diving figures, each twice as big as a human figure. Walk outside the Mall to the waterfront, and enjoy a musical experience with dancing fountains, borrowed right from the Bellagio hotel in Las Vegas. The Mall is not your thing? Go to the viewpoint of the Burj Khalifa (it is accessed from within the Mall), the tallest building in the world, whose top is hidden among the clouds in the early morning hours, and get a magnificent 360-degree view of Dubai, literally from the top of the world. Need more? Go to the Ferrari world park and satisfy you dream of driving a Ferrari California on a racetrack. There is so much to do in Dubai, that it is not advisable to go there for one or two days. 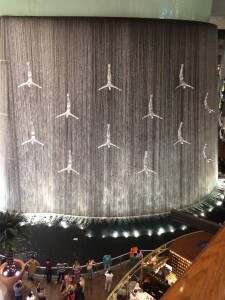 You need that much time just to visit the Dubai Mall. To really savor the experience of Dubai, take your time. Spend a week or two. You will come back with memories that you will cherish for a long time.